Lists of hot books are all the rage for many newspapers and trade publications. But have you ever considered tomes destined to be read by only a few, the anti-Harry Potter, if you will? Perhaps the most appealing thing about Lulu (besides the ability to make your book available to the public at no cost (no ISBN, no distribution)) is the fact that you feel like you are dealing more with the guys who started Napster than a bunch of executive types. I can tell you that Henry couldn't have been more thrilled to be compared, as he put it, "to the old Napster." High praise, from our point of view. A recent Tenebris post got a nice mention from Robert Nagle of the blog Idiotprogrammer, as well as a nod from David Rothman at Teleread, who is one of the web's leading authorities on e-book standards. As usual, I am behind in posting the latest news from the independent publishing front. Don't Publish and Be Doomed, by Paul Carr, appeared recently in the UK Guardian advocating the digitization of books by authors who would then charge Google for the privilege of offering their books through print-on-demand. [excerpt: "The horrible truth is that, with a few exceptions, publishers are some of the most backward people in the world."] He claims, erroneously, that Google has already purchased a print-on-demand service. He meant Amazon.com. Publisher Web sales not clicking with traditional booksellers, proclaims a recent headline from Canada's Globe & Mail. This is not new news, exactly, but the story details publishers' upcoming plans to sell directly to consumers, a move that could provide one more variable in the shifting world of publishing. [excerpt: "'In the end, it's better for the consumer because it will give them access to more products at a lower price,' Pearson's Mr. June says. 'The lines between supplier and merchant are increasingly becoming blurred, he says.'] The story does not mention if the 50% difference in price between selling through a bookstore and selling direct will be passed along to authors. Looking for an editor who can help you develop your own unique voice? Head on over to Book Keppers Editing ... "so sign up today and it will be great." There are about 1,500 what Bowker calls "very large publishers not named Random, Simon, Harper, Penguin and Holtzbrinck," and they publish adult fiction. Then there are what Bowker calles "7000 to 8000 very respectable mid-size, publishers who publish adult fiction." But my guess is that those 7000-8000 are not all traditional publishers. My guess is that many of them are self publishers. I was there once. My company was called Lady Chatterley's Library. Nothing quantified it as an author's own publishing company. So what percentage of the 7000-8000 are authors own companies that do a single title a year? I don't know. But I'd guess at least 2500. Of course there is no accurate number to be gotten because the individuals in question have no interest in conceding that their 'publishing company' might in fact be a vehicle created specifically to publish their books. And what if I create a publishing company to publish my own book but then I decide to publish my wife's book, too? Or my friend's? Or a book by a guy I just met at a cocktail party who mentioned that he had a book? Am I suddenly no longer a self-publisher? There is no meaningful difference between independent publishing on a scale of one book (my own) and publishing on a scale of five or ten or twenty books (by other authors). I know of one aficionado of horror writing who developed his own publishing company--CyberPulp Press--and started publishing e-books by people he knew and then eventually paperback books through Lulu (currently he offers 25 or so paperbacks by various authors). He has a day job that's not related to books. He does all his own editing and typesetting. The books he offers are neither better nor worse than any other book on Lulu, on average. He, by some definitions, would be considered a mid-size publisher. And what about the thousands and thousands of books on Lulu that don't have ISBNs at all, which means that they go untracked by Bowker in its annual publishing totals? What about the novels being published on the Internet in serial form on blogs, like Monster Planet, by David Wellington? These books are being read by someone, even if the audience is very small. What to make of all this? Is it a good thing or a bad thing? I think most reasonable people would agree that there are both positive and negative aspects to the proliferation of books and other content. The overabundance of books is certainly bad from the standpoint of profitability if your business is based on making blockbusters (as opposed to nichebusters). If you are the author of a book--especially a novel--and you want as many people to read it as possible, then the environment may seem depressingly competitive. But for anyone who believes in free and open markets this should be an inspiring sight. For those publishing from among traditionally underrepresented populations it is inspiring. NPR ran a story a few days ago on self-publishing that, as in other recent national stories on the same subject, was woefully under-reported in that it repeated the cliche about paying $500 to get published and then named only the usual, tired suspects--Xlibris, iUniverse, and AuthorHouse--with the addition of BookSurge, which is still riding a wave of newfound respect thanks to its recent purchase by Amazon.com. The best thing about the story, which was put together by self-published author Gloria Hillard and set at the Los Angeles Times Festival of Books, is a quote from someone in the conventional publishing industry who laments the loss of the essential filter provided by editors and publishers [who, like benevolent fathers, protected us from being exposed to bad books]. A better or more willing villain in the drama of the great publishing revolution would be hard to cast. The most important thing to remember about the proliferation of books--good, bad or indifferent--is that it is primarily the product of changes in technology. Technology has altered the economics of publishing to allow anyone to enter the market. 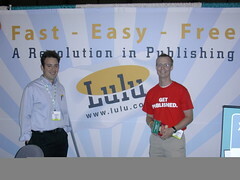 You don't even need $500 to pay the likes of iUniverse; you can publish a book for free on Lulu. There's no going back--there are no thin-lipped editors who can stop the man in the street from saying what he has to say--in print if he so chooses--as tempting as that may be. There's no sense in complaining about the advances made possible by technological progress, a mistake the music industry has made repeatedly and loudly. The only sensible answer is to adapt. I, for one, am looking forward to having plenty to read. That grim prediction hasn't slowed the publishing juggernaut. At the recent industry trade show BookExpo in New York, some 2,000 publishers and other exhibitors rolled out their wares in hopes of attracting the attention of booksellers and librarians who are looking beyond this summer's Harry Potter for the best sellers of autumn. Authorgeddon also popped up in an article on Publish.com (Booksellers Assess the Future of Publishing) and again today in an exchange on BookExpo on The Book Standard. [A skeptical, but accurate, mention also appeared on Dr. Joe's Printing Industry Blog.] My personal favorite display of navel-gazing on this topic in general is the slim 2003 tome by Mexican poet Gabriel Zaid called So Many Books: Reading and Publishing in an Age of Abundance (you can read a sample of the work in an old blog entry on makeoutcity). What's really the case, of course, is that while the number of books is certainly growing, the number of readers is not really shrinking. Reading continues to be an integral part of daily life, as is, for many people, writing--albeit often writing in impoverished forms like email and instant messaging. I would argue that the Internet can be credited with having undone some of the havoc that two or three generations of television wrecked on the practice of reading. Yes, anyone can publish something--blog or book, podcast or independent film. But by virtue of the same technology people are also reading and hearing and viewing a greater variety of viewpoints than ever before, a fact unsurprisingly lost on San Francisco Chronicle books reviewer, David Kipen, who explained airily on NPR yesterday that the evil forces of capitalism are making sure that we aren't exposed to a variety of books. Readers aren't just buying fewer books total, they're buying fewer different books. As conglomerates like WalMart come to dominate a larger and larger slice of the book market, the much smaller selection in stores like theirs has real consequences for the biodiversity of American thought. Hah. Mr. Kipen thinks we are losing diverisity of thought? Send him over to Lulu, which if anything suffers from a distressing level of diversity. Publishers Lunch offers lots of tidbits from BookExpo, including commentary by Robert Gray. Lulu is there for the first time this year, and I am looking forward to the report back from the gang. I'll be in NYC for a post-BookExpo/ pre-Webby Awards party on Sunday night in honor of CraigsList, which I am looking forward to, although I wish I'd been able to be there all week. Not surprisingly, a number of bloggers are in attendance at BookExpo, including Mark Sarvas of The Elegant Variation, so there's no shortage of coverage. Hamlin Endicott, a friend and the proprietor of Sawgrass Books, is also in NYC at the moment walking the floor of the show. Perhaps he'll have some good comments, too.